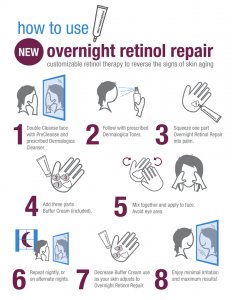 Overnight Retinol Repair is the NEWEST and BEST anti ageing skin product ever to be launched by Dermalogica! 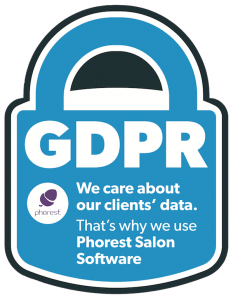 We have tried and tested it prior to its launch and are still using it! The results are fab! As we age our skin goes through structural changes that affect its appearance. Sun exposure, lifestyle habits and internal factors all lead to the key biochemical reactions that trigger skin ageing, which manifests as wrinkles, fine lines, pigmentation and dehydration. This is why we need to intervene and use products to help slow down or in some cases reverse all these tell tail signs of skin ageing! WELCOME the life saver that is- Overnight Retinol Repair! So What is Overnight Retinol Repair? Put simply it is a customizable Retinol therapy treatment cream used to reverse the signs of skin ageing! Active 0.5% encapsulated pure Retinol helps to increase the skins collagen production levels and cell turnover. While powerful peptides and Vitamin C help to reduce uneven skin tone and discoloration. This product also contains copper amino acids which helps reduce visible wrinkles while improving the firmness of the skin! The Retinol and other ingredients in the cream will get to work exfoliating the dead skin cells within the first day of using the product. It will resurface the skin, help stimulate collagen production, brighten and even the complexion and reverse the signs of photoageing! How do I use the product? 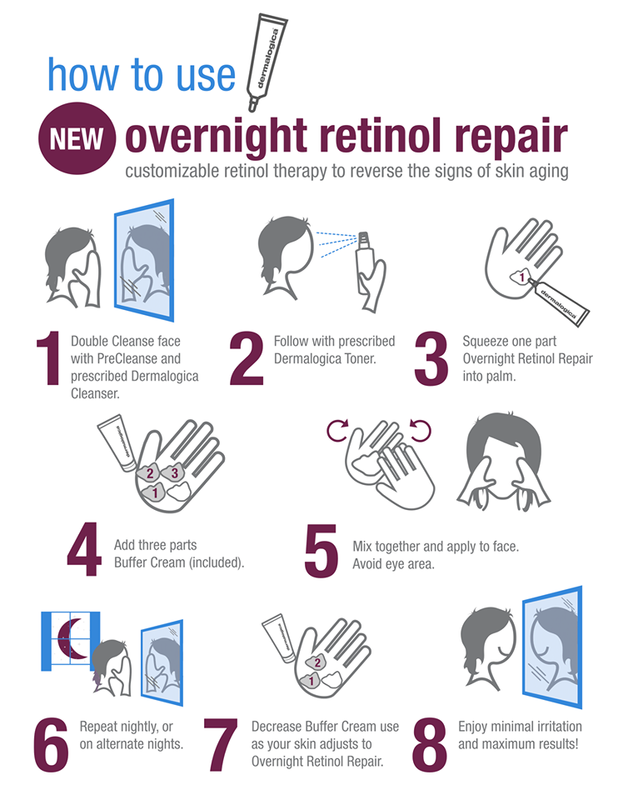 Overnight Retinol repair can be incorporated into your daily regimen. The Retinol Repair Cream comes with a unique Buffer Cream that allows for user-controlled customization while your skin adapts to this potent Retinol therapy. After double cleansing and toning your skin mix the Retinol Repair Cream (1 part) with the buffer cream (3 parts) and apply to the face avoiding the eye area. After a week of use your skin will have begun to acclimatize to the use of Retinol so you can minimize the amount of buffer cream to Retinol Repair Cream (1 part) and Buffer Cream (2 parts). While we recommend the use of an SPF every day it is very important due to the resurfacing effects of this product that you do in fact ensure the use of an SPF and less exfoliation with your other exfoliating products. 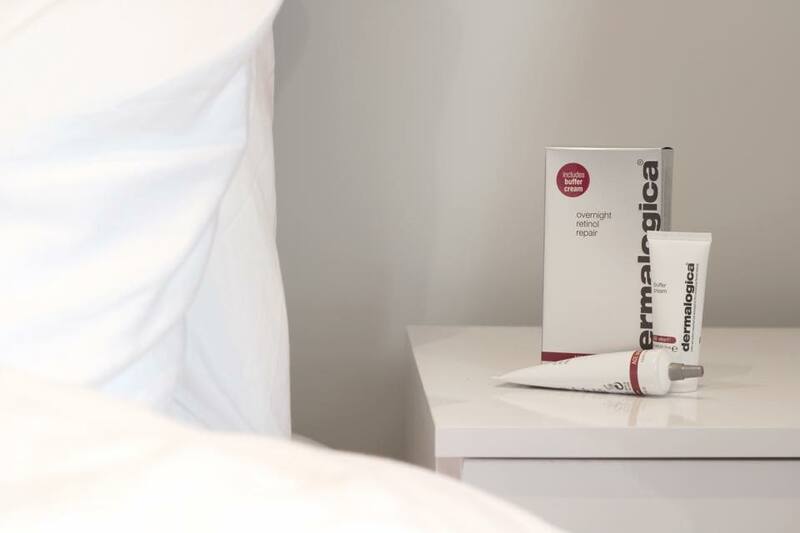 Our Trained Dermalogica experts can explain in detail the correct way to incorporate the product to suit your current skincare routine. Overnight Retinol Repair costs €94.00 for 30ml and as we only use a pea sized amount the product will go a long way and deliver super results, That we are sure of! Do you have sensitive skin?? Waxing – 5 common myths & facts! Vanity Beauty Rooms turns one! Beauty hacks all girls must know! Celebrity Summer Nail Colours 2015! Why should we exfoliate and what benefits will it have for our skin? Sheila rated us 5 out of 5! Catriona, you have a fab salon, spotless & so well cared for and are fantastic at what you do. Thanks. Rachel rated us 5 out of 5! Absolutely love going into the girls in Vanity Beauty Rooms. I always get such a warm welcome and the service is always fantastic. We believe that your waxing appointment should be clinical, speedy and as pain free as possible. We know the importance of a ‘good’ waxing experience! -Lycon is made from the highest quality natural ingredients such as Resins, Beeswax and aromatherapy oils thus providing a nurturing and skin conditioning treatment for extra comfort. -It is especially good for even the most sensitive of skin. It can remove hairs as short as 1mm so there is no down time in between appointments! -With the variation of Lycon waxes stocked in the salon, we are able to tailor waxing appointments to suit the needs of our clients. -We offer a 20% student discount on all waxing services!